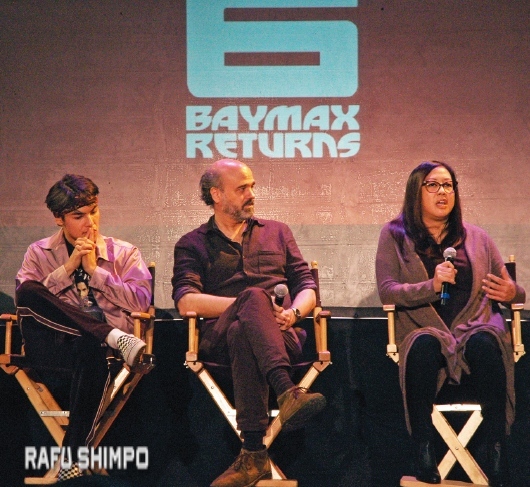 Based on the 2014 feature film, the new series sees many of the original actors reprising their roles, including Ryan Potter (right) as Hiro and Scott Adsit (center) as the robot Baymax. 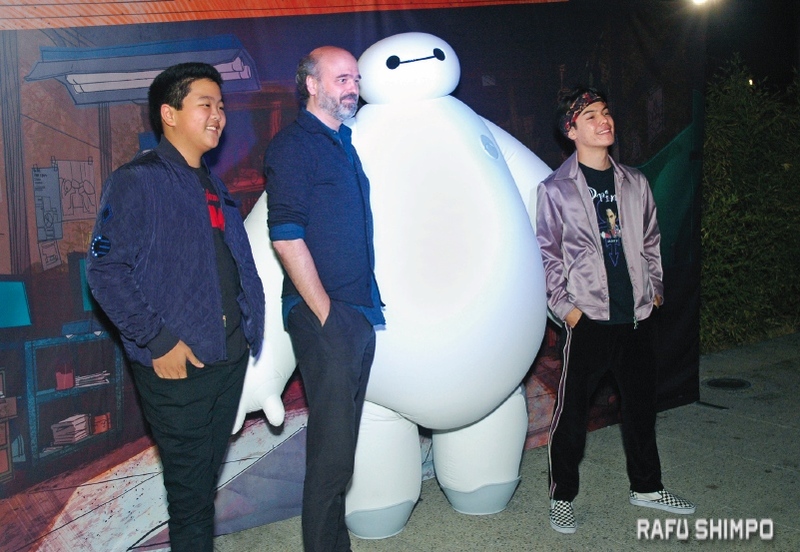 They are pictured with Baymax himself and actor Hudson Yang of ABC’s “Fresh Off the Boat,” an episode of which was also screened that evening. The series, which picks up the story where the movie left off, is in traditional 2D animation. The voice cast also includes Jamie Chung as GoGo Tamago, Genesis Rodriguez as Honey Lemon, Khary Payton as Wasabi (replacing Damon Wayans Jr.), and Brooks Wheelan as Fred (replacing T.J. Miller). Below, line producer Jan Hirota discusses the production of the show. Also on the panel were Potter, Adsit, executive producers Mark McCorkle and Bob Schooley, and writer Han-Yee Ling, with ABC 7’s David Ono as moderator. The show premieres Nov. 20 on Disney Channel and Disney XD. The event was also presented by Disney XD, ABC, and Asian Pacific American Media Coalition.